The Plumbing Museum is pleased to announce a new concert series that will showcase Boston’s emerging music performers and composers. 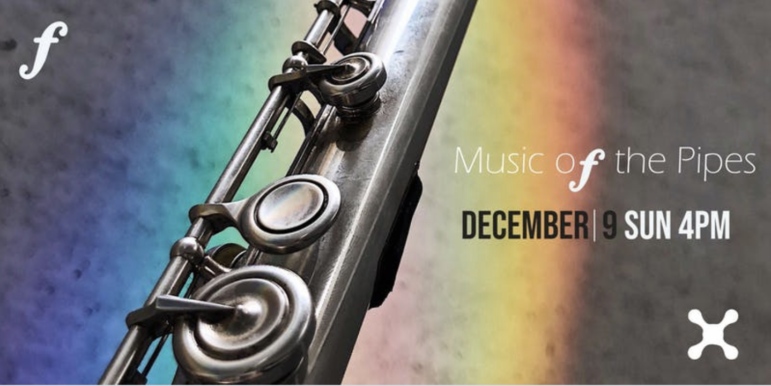 Conceived as a community outreach project, Music of the Pipes concert series brings together a wide variety of musical genres to provide family-friendly, educational, traditional and experimental music programming in an open and fun venue space of the Plumbing Museum. Curated by Antonina Styczen, an internationally award-winning flute player, the first series will feature the flute as a solo instrument in chamber music and in a big ensemble. The program will include music of different genres from the famous Christmas tune “The Nutcracker Suite” by Peter Ilyich Tchaikovsky – in a special arrangement for flute orchestra, to beautiful melodies of Philip Glass “Facades” for two flutes and string quartet, and Jane Rigler’s “Two Seaming” exploring unusual pairing of flute and voice. The program will also feature the premiere of a commissioned piece by a young, Spanish composer, Pedro Osuna, for flute and string quartet. “We are excited to provide a new variety of music to our neighborhood and expand our community outreach initiatives. Through imaginative programming, traditional chamber music, jazz, and new compositions, we hope to make connections with musicians, composers, and listeners of all ages,” says Sasha Parfenova, Museum Program Manager. For more information, please visit www.theplumbingmuseum.org or call 617-926-2111. About Music of the Pipes: The Music of the Pipes concert series promotes young, Boston based performers and composers and provides a new stage where musicians can share their passion for creating music with their audience. Through bringing together a wide variety of musical genres, Music of the Pipes produces family-friendly, educational, traditional and experimental music programming in an open and fun venue space of the Plumbing Museum. About the Plumbing Museum: Located in a renovated ice house in Watertown, MA, the American Sanitary Plumbing Museum is dedicated to promoting the contributions of the plumbing industry and its talented craftsmen across the United States. Through its unique mix of industrial history and modern art, it showcases artifacts and exhibits that range from 19th century tubs to modern toilets and a functioning rainwater reclamation system. The museum welcomes nearly a thousand visitors each year for tours and private events, and has been featured in the Wall Street Journal. For more information, visit: www.theplumbingmuseum.org.